Sign up below to gain instant access to this valuable information! All you need to do is fill out the form to the right, and your FREE Report will be sent to you immediately. It's impossible to keep your boxer out of trouble. He's adventurous, curious, and energetic. In other words, he's a recipe for trouble, but that's why you love him. Rather than attempting the impossible, keep yourself prepared for emergencies with a properly stocked first aid kit and knowledge about what to do in the most common urgent situations. Just fill out the short form below, and your new report will be sent to you right away! 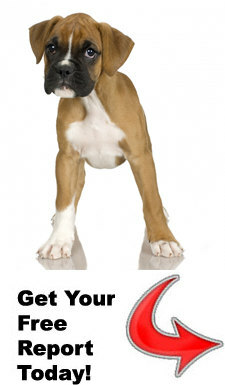 You will also be subscribed to the Boxer Dogs News & Tips Newsletter. You can unsubscribe at any time.